Scotland's Biggest Power Source Is Renewables! Scotland’s Biggest Power Source Is Renewables! WIND BEATS NUCLEAR, COAL, AND GAS! Scotland’s renewable energy generators have moved into 1st place. Scotland produced more energy from renewables than any other source including nuclear power. This is another milestone on the road to 100% sustainable renewable energy generation in Scotland. It will be how we in England will respond to this obvious challenge. 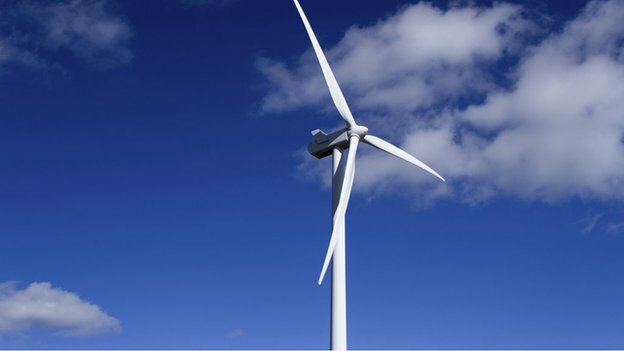 Renewable power has overtaken nuclear to become the main source of electricity in Scotland, the latest figures have suggested. Wind and hydro power produced 10.3 terawatt-hours (TWh) of electricity in the first six months of this year, UK government statistics showed. Meanwhile, National Grid figures showed nuclear power stations generated 7.8TWh over the same period. Environmental campaigners said it was a “significant landmark”. National Grid said 5.6TWh of electricity came from coal-fired power stations in the first half of this year, with a further 1.4TWh from gas-fired stations. Scottish Energy Minister Fergus Ewing said the figures showed that the country was continuing to make “good progress” towards its target of generating the equivalent of 100% of Scotland’s electricity demand from renewable sources. He added: “The fact that energy from renewables has exceeded that from nuclear in the first half of 2014 highlights the vast potential of renewable generation to provide a safe, secure and cost-effective means of electricity generation for this country, together with appropriate levels of thermal generation. Niall Stuart, chief executive of the industry body Scottish Renewables, said there was still “plenty of potential” for more to come from renewable power, with offshore wind and marine energy still in the early stages of development. Mr Stuart added: “This important milestone is good news for anyone who cares about Scotland’s economy, our energy security and our efforts to tackle climate change. He added: “The renewables industry has come a long way in a short space of time but there is still plenty of potential for further growth. Lang Banks, director of the environmental group WWF Scotland, said: “Last month, while nuclear reactors were forced to shut because of cracks, Scotland’s renewables were quietly and cleanly helping to keep the lights on in homes across the country. But Paul Younger, professor of Energy Engineering at the University of Glasgow, said it was important to keep a sense of perspective. He added: “It’s true that we’ve seen an increase in both the installed capacity and output of wind generation over the last year or so, but the 2013 closure of the coal-fired power station at Cockenzie and the downgrading of the gas-fired power station at Peterhead have had a much more dramatic effect on the percentage balance of generation sources. “What we are seeing is a loss of capability in Scotland to generate on demand. Basically, nuclear generates steadily, 24/7 and we can increase generation from coal and gas as and when we need it. We desperately need not to lose sight of that.